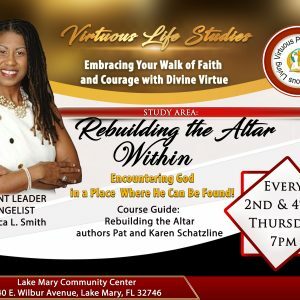 Join us this 4th Thursday for the Virtuous Life Studies! Virtuous Life Studies is a dynamic group of individuals determined to Embrace their Walk of Faith and Courage with Divine Virtue. Come join this Transformational group of Believers as we experience God’s Presence in an environment of Prayer, Praise, and Powerful Life-changing Teaching! !